So I finally decided to start assembling an army seriously. So far I put together half a platoon of guys for my homemade custom world regiment. A bit about that first. I was always interested in 40k fluff more as a template to work upon, especially since a universe with such a size and variety is perfect for that kind of thing. Thus when I decided to make my guard army I didn't want to go with one of the famous regiments, but had an idea about making my own instead. I like Catachan or Elysian aesthetic a lot but they are much better suited to represent veteran squads rather then regular guardsmen IMO. Most wars of the galaxy are fought by simple guys from some unknown planet and I think this idea represents what the Guard is all about a lot. Since the regiment from a less known planet needs to have a unique look, I'll get to to do a lot of converting. But the question of choosing the miniatures still stands. 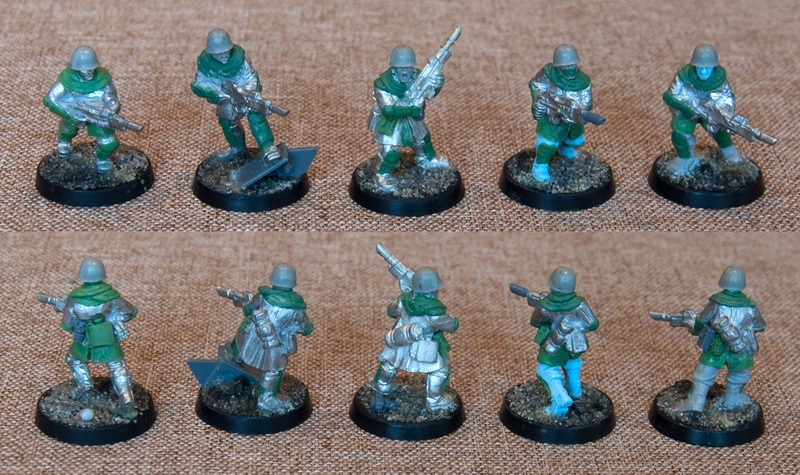 The easiest way is to pick plastic Cadian or Catachan infantry but those are killing me with their lack of proportions. Newer command squads are nice, but the basic infantry squads still look horrid, so that's a no. I could find some alternate models but getting the weapons for the whole army is too much. Forgeworld's Krieg and Elysian minis could do, but they aren't cheap, which is particularly bad, given that I'd mostly pay for the small details on the guardsmen, a lot of which are unique to their homeworld an as such would have to go. So the only variant left was to go with old metal guard models. 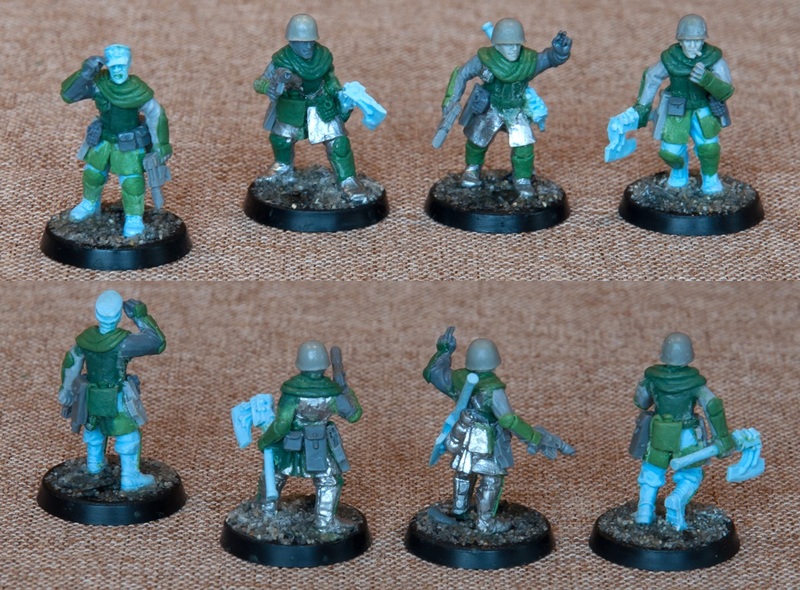 After a quick look I decided that Steel Legion guys would suit my needs. Metal is obviously not that good for conversions but I decided that it was doable if only as an interesting challenge. Contrary to the multipart plastic the metal miniatures also lack in poseability, so I took some time to repose some of the guys. I decided to leave the heroic poses to Space Marines so my guys are made to be a bit more natural-looking - lieutenant is adjusting his cap while sergeants are smoking up and giving up orders to the privates. It took a lot of green stuff, but I think the result is worth it. The only thing missing now are special and heavy weapon guys. I'll be sure to get to those some time later so stay tuned. Impressive green stuff work here. I'm looking forward to seeing them painted. I also like the Steel Legion models, but I agree with you that I would like to be able to do some conversions. It looks like green stuff is a great way to add your own touch to the models. I need to start working on my sculpting skills! Thanks. My sculpting skills still leave a lot to be desired, but year, GS is a converter's best friend.